If you are visiting for the first time, this will provide info on the impetus behind "Inclusive Asheville." Beverly Daniel Tatum: Why Are All the Black Kids Sitting Together in the Cafeteria? Dave Eggers: What is the What? Innovative, experiential, challenging, and meaningful learning experiences around issues of diversity, inclusion, culture, status, and privilege. Okay, so I'm a little biased about this one. Practical tools and exercises to use with teams in your workplace. Great exercises, tools, checklists, and info. The man is just plain smart. McNaught has written some of the best books I've read on sexual orientation issues in the workplace. Good work on what is a tough topic for some. Great intro to cross-cultural issues in the workplace. Great compilation of important works. He is one of the smartest people I know. Read anything by him. One of my very favorite people in the world and someone who knows better than anyone what it is to be an intercultural being. 2007 RETREATS - Join us! -- Brian Butler, UNC Asheville Philosophy Department chair, will present "Gender, Law and Justice" at 12:30 p.m. Monday, March 26. Butler will discuss the influential work of renowned legal mind Catharine MacKinnon, who helped shaped the American legal system to acknowledge gender discrimination, sexual harassment and the conflict between equal rights and free speech. Butler served as MacKinnon's research assistant at the University of Chicago. -- UNC Asheville senior history students Lili Lopez and Ashleigh Poteat will give talks on women's roles in two international movements at 12:30 p.m. Tuesday, March 27. Lopez will examine "Women Revolutionaries in El Salvador" and Poteat will discuss "Egyptian Women in the Muslim Brotherhood." -- "Women of the World, Our Global Sisters," an exhibit of 25 images of women from around the world by Black Mountain photographer Mickey Buckwalter, will be on view March 1-30 at UNC Asheville's Blowers Gallery. Buckwalter will give a gallery talk at 1 p.m. Wednesday, March 21, in conjunction with Women's History Month. Over the past 24 years, Buckwalter has traveled to more than 40 countries and all 50 states photographing women. Blowers Gallery, located on the main floor of UNC Asheville's Ramsey Library, is open during regular library hours. For hours of operation, call UNC Asheville's Ramsey Library at 828/251-6546. --The seventh annual "F-Word Film Festival: A Celebration of Images by and about Women (But for All Audiences)" will feature five feminist documentaries at 7 p.m. March 15 and 16 in UNC Asheville's Humanities Lecture Hall. Panel discussions with UNC Asheville faculty and students will follow the screenings both nights. -"The Beauty Academy of Kabul" and "I had an Abortion" will be screened on Thursday, March 15. 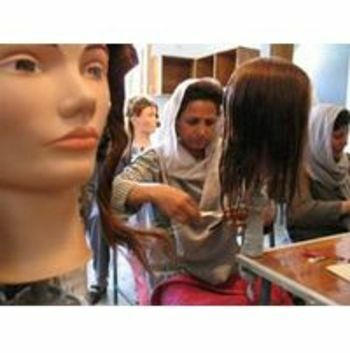 "The Beauty Academy of Kabul" explores the relationship between Western hairstylists and the women they teach after opening a beauty school in post-Taliban Afghanistan. "I had an Abortion" features 10 women who describe their abortion experience, with stories spanning seven decades. -"I was a Teenage Feminist," "Far from Home" and "Nalini by Day, Nancy by Night" will be screened on Friday, March 16. "I was a Teenage Feminist" explores why young, progressive women feel uncomfortable identifying with feminism. "Far from Home" follows the life of Kandice, an African American teenager in Boston, as she is bussed from the city to predominately white suburbs to attend school. "Nalini by Day, Nancy by Night," details the life of filmmaker Sonali Gulati, who investigates the phenomenon of outsourcing telephone support service jobs to India. For more information about Women's History Month events, call the UNC Asheville Women's Studies Program at 828/251-6419 or go online at www.unca.edu/womensstudies. jack on Why Don't We Know Who Tamika Huston Is?